This post is part of a series. To read the previous post click here. To read the first post click here. Having the best product vs having the best marketing machine. As indicated in our previous Android smartphone review, the LG G3 is hands down a much more complete product when compared to its Samsung counterparts. While both phones have health-related extra features like built-in pedometers and apps that shows how many steps you have taken in a day etc., Samsung actually goes much further in the bells and whistles department. It has a heart-rate monitor, fingerprint security, and air gestures to name a few (for a complete review and the assessment of the usefulness of these features please read our previous post here) but none of those features answer the questions of usability. They are nicecool-to-haves more than necessities. LG on the other hand has developed a product that addresses the smartphone usage concerns of its customers. The phone’s features are very customer centric and very well thought out. We have not met a single person who has used the LG G3 and not absolutely love it. Yes, we also mean the cell-phone photographer enthusiasts. But here is the main obstacle that stands between LG and more market share: Marketing. Look at the chart above. What do you see? If you answer Samsung, rest assured you have no problem with your vision. Now look a bit closer at the quarter to quarter adoption rate. 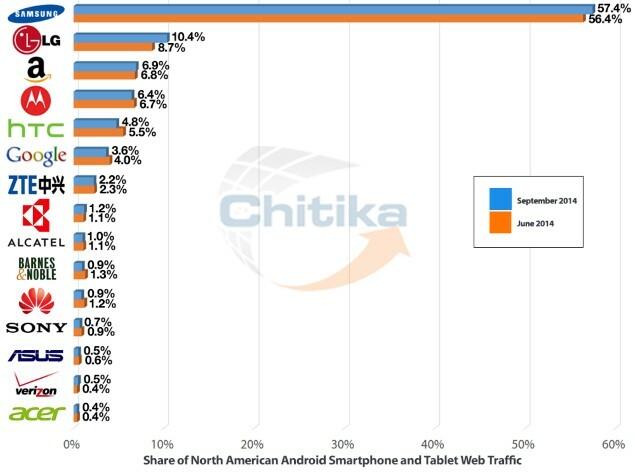 Who is picking uo the most market share? Yup, it’s LG. So the question is, who do you want to be in this race. We are not going to dwell on the fact that LG’s partnership with Google in producing the Nexus line of phones bogged dowb their marketing etc. Our focus is on analyzing who has a future and who doesn’t in this matchup. We would love to say it is LG, but with the Samsung Galaxy S6’s rumours already making rounds on the internet, it remains to be seen how long it would take for the consumers to figure out who is selling a superior product and who is just throwing out a bunch of phones and going they stick. So far Samsung’s strategy has paid dividends and the company is the leader when it comes to Android handset sales. We would be very curious to see the results for the fourth quarter of 2014. Our prediction is that a slow-down (or worse a swing into the red) for Samsung would indicate serious issues and speak volume regarding the fact that the consumer class as a whole has made a decision to take their business elsewhere, be same way they did with HTC since late 2011. We will update this post when the data is available. Posted on December 3, 2014 by encure	• This entry was posted in Hardware, Marketing. Bookmark the permalink.